A DONEGAL parish is inviting people to take part in a four-day and four-night marathon reading of the Bible this Easter. The round-the-clock reading is being organised by St Eunan's Church of Ireland in Raphoe, Co Donegal, to mark Holy Week. It will see the Christian book read aloud non-stop from cover-to-cover in the town's historic Church of Ireland cathedral. The Bible texts will be read consecutively in almost 200 half-hour sections, with readers invited to book the appointed time of their favourite passage. Dean of Raphoe Arthur Barrett said the unique event is a chance for the entire community to "join together in reading God’s word". ”People will be more than welcome to come and read the Bible at any time of the day or night or just listen to the bible being read and to enjoy the atmosphere of our ancient cathedral church," said Rev. Barrett. 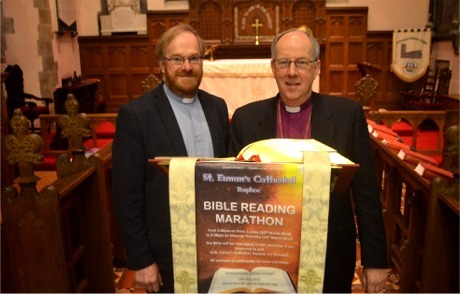 The Dean of Raphoe, Arthur Barrett with the Bishop of Derry and Raphoe, Ken Good, in St Eunan's Cathedral where the Bible Reading Marathon will take place. The marathon reading is being organised as part of the diocese's Year of Opportunity, focusing this year on mission, generosity and children. Participants are invited to book a 30-minute session of their choice from Palm Sunday, March 20 at 8pm to Maundy (Holy) Thursday, March 24 at 8pm. “You may wish to read for longer or to read on more than one occasion," added Rev. Barrett. To take part, contact Rev. Barrett at email bible.raphoe@gmail.com or by texting 085 8833856.